The Cast of Henry V.
BOTTOM LINE: An ensemble driven, minimalist production that features skilled actors in command of a beautiful text. As the house opens, 11 actors (9 women, 2 men) are seen warming up, preparing to perform a pared down and minimalist production of Shakespeare’s Henry V. No effort is made to hide the artistic process. We watch as actors stretch their bodies and warm up their vocal chords. 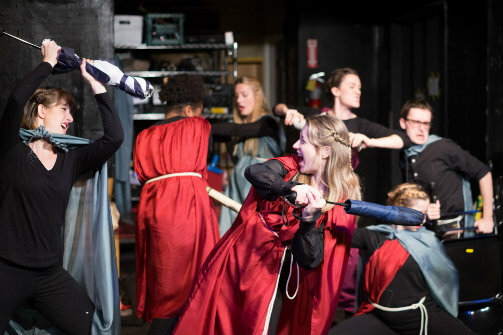 Fight sequences are reviewed with the help of stage manager Leslie Ann Kent, who then asks if the performers feel safe, “physically, emotionally and otherwise.” Actors feel free to converse with the audience and greet their friends and family. The result of this transparent environment is what ends up feeling like a classroom production of this great play. I felt as though I had been invited to watch a final semester project at one of New York’s fine acting schools. Henry V is the perfect Shakespeare play to perform in this format. The very first speech—the famous, O, For a Muse of Fire, performed with great passion and a flawless command of the language by the company’s artistic director Malka Wallick—admits and apologizes that the resources available to stage the play are inadequate. Wallick implores the audience to make use of its collective imagination. The minimalist approach enhances our appreciation of the text and allows us to celebrate the beauty of the language. This is probably Shakespeare’s most accessible history play. The premise is simple: King Henry (Brenna Yeary) resolves to conquer France, claim the French throne for his own, and take the French Princess, Katherine (Alejandra Venancio), as his queen. Though the battles are hard and costly, Henry’s efforts prove victorious and culminate in an irresistible scene in which he woos Katherine with great charm and humility. In addition to the brilliant Wallick, Yeary and Venancio’s performances stand out. Yeary is naturally regal as Henry, and she displays confident wisdom and a genuine concern for the soldiers that we wish all of our leaders possessed. Venancio’s effortless ability to perform an entire scene in French is enchanting, and her earnest effort to learn English is tickling. Personally, I would purchase a ticket to hear Venancio read the phone book, providing she did so in French. Costume designer Liliana Casabal helps tell the story seamlessly with her elegant and functional use of red and blue tunics that distinguish between English and French characters, respectively. But the production’s greatest asset is Kelly Monroe Johnston’s magnificent staging. Johnston has no set and hardly any props to work with, and yet he manages to capture the relentless violence of combat using nothing but a series of tableaus. He also provides an illustrious moment in which Henry and his men arrive on the shores of France on what appears to be an enormous warship. Again, it’s nothing but the composition of bodies in space that creates the illusion of a ship. This is a director that is well acquainted with his toolbox and wastes no time lamenting the lack of resources. All directors should have to make art under these conditions; it would infuse the theatre with a renaissance of creativity and innovation. As written, Henry V is obviously a male dominated play, and yet this production, which is performed almost exclusively by women, stops just short of making a statement about gender. Something seemed haphazard about the casting. I would have liked to see the company own the fact that women dominate the stage in this testosterone-driven play. I was left with many questions. Why include two men at all? And why for those two roles specifically? If they must include the men, why not ask them to play women as the women play men? It seemed that women played men’s roles simply because there weren’t enough men from which to draw. Nevertheless, the production is solid and will remind you of the beauty and simplicity of this glorious text. Henry V is by William Shakespeare. Directed by Kelly Monroe Johnston. Costume design is by Liliana Casabal. Lighting design is by Susannah Baron. Amy St. Louis is the musical director. The stage managers are Leslie Ann Kent and Margo Murphy-Gross. The cast is Sarah Bonner, Tim Dowd, Dee Dee Popper, Alejandra Venancio, Malka Wallick, Brenna Yeary, Alyssa May Gold, Elizabeth M. Kelly, Jess Milewicz, Adam Kee, Madeleine Escarne and Brandon Rachal.